Edinburgh head coach Alan Solomons is making a top quality centre his highest signing priority over the close season. 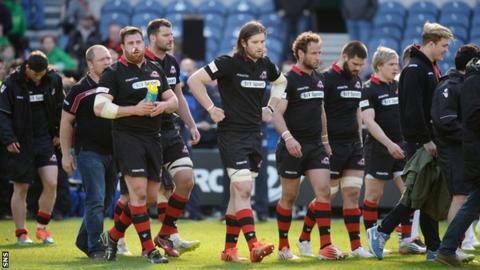 The injury-depleted Murrayfield side finished their 2014-15 Pro12 campaign with a 23-36 loss to Leinster. "We need an X-factor outside back, that's absolutely critical for us," Solomons told BBC Scotland. "We really miss Matt Scott hugely and he adds that X-factor. He's had a litany of injuries and that's very unfortunate." Shoulder injuries have meant 24-times capped Scotland international Scott has played very little rugby for Edinburgh since Solomons took charge in the summer of 2013. Also missing for the season finale were key players like Dave Denton, WP Nel, Grant Gilchrist and Roddy Grant. It meant Edinburgh's slim hopes of reaching a play-off against Gloucester to try and qualify for the European Champions Cup next season were extinguished. Instead they will compete again in the Challenge Cup, in which they were beaten finalists this season. It is the second consecutive season Edinburgh have finished eighth, but they increased their points tally by 10 this time around. "The boys played well up against an almost full-strength Leinster side with a lot of Irish internationals and experience," said South African Solomons. "In the 65th we were 23-22 up and it was only in the 71st minute we turned over a scrum on our 10m line and from there they scored and the game was gone. "I can't fault the effort from the players throughout the season. Being the first Scottish side to reach a final in Europe was fantastic. "Although we fell at the last hurdle in terms of our goal, we were right in it until the last weekend. But for injuries and so many back-to-back games because of the Challenge Cup, I think we could've done it. "There is massive progress. I'm very excited by the new season and we've really got to move this thing forward." Hamish Watson and Harlequins-bound Tim Visser scored Edinburgh's tries, but last season's Pro12 winners Leinster had too much for the hosts in the end, with Noel Reid, Jack Conan, Jordi Murphy, Luke McGrath and Zane Kirchner all crossing over. Solomons paid tribute to Netherlands-born Scotland international Visser's six-year spell at Edinburgh. "I think it'll really freshen him up going to a different competition and a new club," he explained. "We all wish him well. He's been a great servant to Edinburgh and I've really enjoyed coaching him. "We've already had a planning meeting for next season and have got quite a lot of things in place. "We can now spend next week making sure that we do all the admin and medical profiling with the players and then send them on their way. We will then stay here for two weeks and make sure our whole pre-season is organised before we leave. "The players will get a good five weeks off which they desperately need."